Sofzsleep latex cores and accessories are manufactured in Belgium, in full compliance with the European regulation 1907/2006, Registration, Evaluation, Authorisation and restriction of Chemicals (REACH), which aims to protect human health and the environment. 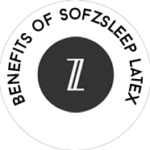 Sofzsleep uses natural latex sourced from rigorously selected and tightly regulated plantations. Upon arrival at our factory in Belgium, the raw rubber sap is mixed into a compound. Compressed air is added to the compound to work it into a foam. The desired mold is filled with the latex foam by robotic automation to obtain an even distribution of the latex in the mold. The mold closes and enters a vulcanization oven. The form is then “baked” at 100 degrees centigrade to solidify into our Core. The finished Core is thoroughly washed to remove any residue and rigorously dried to remove all moisture. 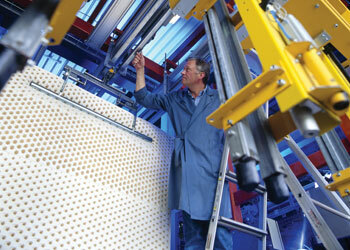 The factory in Belgium produces mattresses, pillows and toppers in latex. There are 4 mattress production lines with a production capacity of 1 million pcs per year, 1 pillow production line which can produce 650.000 pcs/year and 8 topper production lines which can produce 4 million running meter per year. The entire production of our products is rigorously regulated and monitored to ensure cleanliness and hygiene. Every product is visually checked on factors such as size, density, firmness and most importantly, overall quality. Approved products are then sent to our Asian assembly plant for cutting and finishing to various sizes. Rigorous procedures are in place to make sure that every product that leaves our factory and delivered to you are of impeccable premium quality. We routinely have products randomly selected for full durability testing to ensure that they can withstand various stresses. You’ll be great in bed. Browse our mattress collection and discover how you will be sleeping great in bed. Because nothing we say about our mattresses can compare with trying them out for yourself. Subscribe to useful tips, promotions & giveaways.